All information about selling hats, stranges or other items to our bots. You will have to wait some seconds and try again by refreshing the page or by clicking on the refresh button. Sometimes that happens because of the APIs or GCs that we are using are down. When will the bots get refilled/restocked? Bots can not be "filled" by the staff. All bots are filled and stocked only by user trades. For example, the hat bots will only get more metal if more users buy more hats. The card which you are trying to sell probably doesn't have a price set or is overstocked. That happens because there aren't enough units being sold in the Steam Community Market, meaning that we cannot set a price to it because we can't calculate the average price of said card. Why can’t I see the game I want to bank? Your steam gift inventory settings are set to private. We are not currently accepting that game, either because the game banking manager decided so or because it cannot be banked. 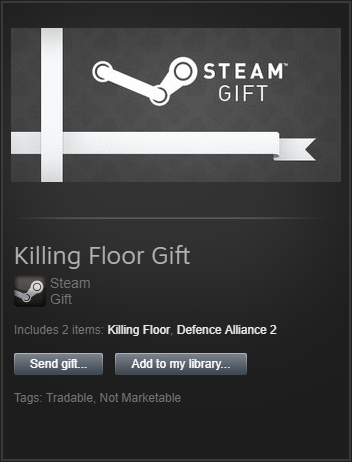 If it's the latter, the gift will be using the Steam Gift placeholder image. Example. Your game is region locked. You are trying to sell a game that has been added to your Steam Game library instead of a gift that is in your Steam inventory. It says that my skin is overstocked when it's not! It could mean that we are not buying or selling that skin yet. You will have to wait until our site is able to get an average price of said skin in order for it to have a price. Remember that our stock limit in skin banking is of two units of every wear per skin. I can't sell my skin! It's not tradable (check the item from your Steam inventory). The information that we are getting from your backpack is outdated. Try opening and closing TF2 or close TF2 if you already have it opened. We cannot calculate a price for it because it does not meet one (or many) of the conditions required for us to do said calculation.